Some of the information contained here was sourced from UseNet news, plus some from the MML. The Minolta CLE is first introduced in around 1974 and disappeared in the new-camera markets in around 1983. Modern Photography has its test reports on their June, 1981 issue. The early models have old-style minolta letters shown on the top and front, while newer models have the new MINOLTA letters (like current Minolta bodies). I am trying to find out some info about flash compatibility--perhaps you know the answer. As far as I can find out, the Minolta CLE was Minolta's first camera with TTL flash, followed by the X-700. I believe this is correct, although the X-700 followed quite closely. Apparently, they use the same TTL system, although I am not sure of it. Yes, they definitely do use the same TTL flash system. For quite a while I owned both a CLE (which I later foolishly traded for a Leica M-4P -- darn, I sure wish I had that CLE back now, as I'll never be able to afford one at the prices they bring nowadays!) and an X-700 simultaneously, and used the same flash system and accessories on both. I would like to find out for certain if the flashes for the X-700, especially the larger 280 and 360, are fully compatible with TTL flash on the CLE. Yes, in addition to its own Auto Electroflash CLE, any PX-series flash unit is fully compatible with the CLE's TTL system. I would also like to know if the 360's Minolta's triple connector to use 3 flashes on the CLE. Yes, this accessory will work. If you don't want to use the triple connector, you can also "daisy-chain" the units together with full TTL metering. For example, you could mount a 360PX on the camera's hot shoe, and use a Cable CD to connect it to another 360 (or 280.) Or, you could mount your first 360 remotely with an Off-Camera Shoe (which has its own accessory socket); connect a Cable OC from the camera's hot shoe to one accessory socket on the flash; a Cable CD from the other accessory socket to an accessory socket on the second flash; and so on, as far as you want. In principle there's no limit to how many units you can add, although results start getting unreliable once the TOTAL length of the cables starts getting much over 25 feet or so. I'd set up my two 360PX units, joined by an "extra-long" Cable CD I had made by cutting off the ends of the Minolta cable and splicing in about 20 feet of four-conductor telephone cord. One of the units would go on a lightstand, the other on the camera. First, though, I'd prepare the camera by putting a strip of masking tape in the flash shoe, so it covered the sync (center) and flash-ready (left) terminals, but NOT the TTL (right) terminal. As mentioned above, the CLE not only had its own flash, it could also use the -PX series flashes and many of their accessories, introduced for the X- series SLRs. The CLE can be triggered remotely by the same electrical releases available for the X- series MF bodies: Remote Release -S and -L.
The following is a posting from the MML. The Leitz/Minolta CL is exactly the same camera as the Leica CL, just a different nameplate. I believe it also was sold in the Japanese home market under the name 'Minolta CL.' All are exactly the same camera mechanically. The Leica-nameplate version was offered only in 1973-74, but the Minolta variants remained available for a longer period. The CL was designed jointly by Minolta and Leitz, and all the production cameras were manufactured by Minolta in Japan, regardless of under which brand name they were sold. It was a compact rangefinder camera with a vertically-traveling cloth focal plane shutter having speeds from 1/2 to 1/1000 sec., and a match-needle metering system that read through the lens via a CdS cell mounted on a swinging arm. When the film was wound, the cell would swing out on its arm to measure a circular spot just in front of the film plane. When the shutter release button was pressed, the arm would flip out of the way just before the shutter opened. In spite of this flipping motion, the camera was quiet and operated smoothly. The meter was turned on and off by pulling out or pushing in the film advance lever. The camera was nicely made and well finished in black chrome. The CL's viewfinder was bright and clear, and included frame lines for 28mm, 40mm, 50mm and 90mm lenses. The rangefinder patch had clearly defined edges, like a Leica M camera's, and was slightly rounded at the sides; if you mentally extended these round sides into a full circle, they indicated the reading area of the meter when the 40mm normal lens was in use. There was a shutter speed scale at the top of the finder with a red pointer which indicated the speed in use. Since speeds were set via a vertically-oriented dial on the camera's front edge, you could very easily set the shutter speed you wanted with your index finger, without taking the camera away from your eye. The meter readout was a match-pointer needle along the side of the finder; you'd adjust aperture and/or shutter speed until the needle centered in a square notch. If I remember properly, the Leica-branded version of the CL came with a German-made, Leica-brand-name 40mm f/2 Summicron-C normal lens. The Minolta came with a Japanese-made, Minolta-brand-name 40mm f/2 M-Rokkor lens. These lenses apparently were identical in design and construction. I believe that the 28mm lenses also were sourced similarly: a German-made 28mm f/2.8 Elmar-C or an identical Minolta M-Rokkor. ...The CL camera, and all its lenses, were equipped with a Leica M-type bayonet mount flange. This meant that in principle, any Leica M lens could be used on the CL, and any CL lens could be used on an M-series Leica. In practice, though, there were several problems with this. For one thing, some really old Leica wide angle lenses stuck so far back into the camera body that they would hit the meter cell on its swinging arm; these could not be used at all. Longer, faster lenses, such as the 90mm f/2 Summicron, could not be used safely on the CL because its rangefinder base was too short to focus them with complete accuracy. And all the CL's lenses had unusually short focusing throws and short, steeply curved rangefinder coupling cams; this meant they didn't always couple with full accuracy when used on M cameras. The CL also had some design problems, mostly inherited from Leica (!) The shutter -- basically a Leica M shutter turned on its side, but with simplified bearings and gears -- sometimes became slightly erratic at older age, and the meter also could become erratic because of metal fatigue from constant flexing of the wires leading into the swinging arm. To solve all these problems, and generally modernize the camera, Minolta completely redesigned it and re-introduced it as the Minolta CLE. This design was a 100% Minolta project with no Leica participation, so it was sold under the Minolta name in all markets. Improvements in this camera included: very accurate, electronically-controlled, horizontally-running cloth focal plane shutter, derived on the ones used in XG-series Minoltas; redesigned type of rangefinder, still with frames for 28, 40 and 90mm lenses but with a longer base length for more accurate focusing; lenses having 'flatter' coupling cams, giving more accurate coupling when used on M cameras; and a very sophisticated metering system incorporating aperture-preferred auto exposure. The swinging arm was eliminated by using a silicon photocell in the camera base, which took full-area-average readings off a pattern of spots on the shutter curtain before exposure, or off the film itself *during* exposure. (Yes, it continued to read the light while the shutter was open, and could change the shutter speed if necessary during the exposure!) Dedicated TTL auto flash operation also was provided with either the matching Auto Electroflash CLE or any PX-series Minolta flash unit. Minolta made its own 28mm, 40mm and 90mm lenses for the CLE, accounting for the 'made in Japan' version of the 90mm noted in the original poster's question. Note again that these lenses had coupling cams with slopes less steep, making them more likely to focus accurately on the CLE. The CLE also could use a wider range of Leica M lenses, although there were still some focus accuracy problems with super-fast or long lenses because of the camera's more compact size. The CLE was a big improvement over the CL, but unfortunately it was quite expensive and rangefinder enthusiasts thought that a mere Minolta could never be as good as a real German-made Leica, so did not buy it in large numbers despite its handsome workmanship and technical sophistication far in excess of any Leica model. Today they are sought after by collectors and rather costly. The CL is less expensive, but still not an inexpensive camera to buy used. Some people prefer it to the CLE because of its spot meter, the fact that the meter can be used in manual exposure mode (CLE had manual exposure but meter was turned off) and because its shutter works without batteries. It is still a very nice camera to use if you don't mind the limited range of lenses. Incidentally, 'Leitz/Minolta' CLs tend to be later production than 'Leica' CLs, so are less likely to develop the erratic shutter and meter faults noted above. Silly collectors will pay more for ones bearing the holy name of Leica, though! Does anyone know anything about these old screwmount cameras? I bought one and had it repaired, but I have a few questions. Ah, yes, the Minolta 35. I've never handled one, but has the reputation of being nicely made and with good lenses. The lens mount is a Leica-type 39mm screw thread -- so you can trump everyone else in the recurring lens-mount whinge by fuming, "That @#$%$#@ Minolta keeps changing their lens mounts, so I can't use Vectis lenses on my Minolta 35 Model II! Geez, if a lens mount was good enough in 1953, it should be good enough now, shouldn't it?!?" 1. The size of the negative is just a tiny bit more narrow than my other cameras (so the space between frames is just a bit wider). 2. I can't find how to put a cable release on the camera, if there is a way to do that. I can't be sure from the pictures I'm consulting, but it LOOKS as if it might use the same type of cable-release mount as a Leica screwthread camera. You unscrew the guard ring around the shutter release button, revealing a thread over which you can screw a cup-type cable release adapter, which then accepts a standard cable release. Some cable releases used to come with this adapter, but you might have to hunt a bit to find one now. Failing that, use the self-timer. Anything else you might know about the camera would be welcome. Well, McKeown says the original Minolta 35 of 1947 was Minolta's first 35mm camera, and went through six minor model changes before the similar-looking Model II was introduced in 1953; it continued until 1958, when the Model IIB came out. And in one of his 'Camera Collector' books, Jason Schneider recounts that the optional 50mm f/2 Super Rokkor lens was one of the finest of its day, testing well even by modern standards. Other than that I'm clueless. 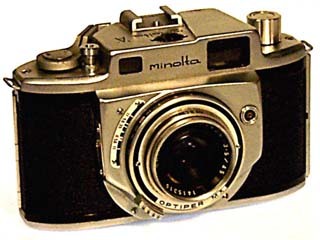 This is a photo of a very early rangefinder called the Minolta A. According to "Cameras The Facts" it was introduced in 1957 (Model A in 1955, A3 in 1959). Lens: Non interchangeable 45mm f3.5 (Model A), f2.8 (Model A2) Rokkor, 5 element triplet type, taking 36mm push-on filters. Shutter: Optiper MXV speeded 1 sec - 1/400 and B, set on wheel on top of camera. Coupled rangefinder focusing down to 2.75 feet. Scale of image in v/finder 2/3 natural size. No exposure meter. Weight 24 ozs. Price new between �30 and �50. Another resource: http://www.jetlink.net/~cameras/cle.htm (lots of nice photos).